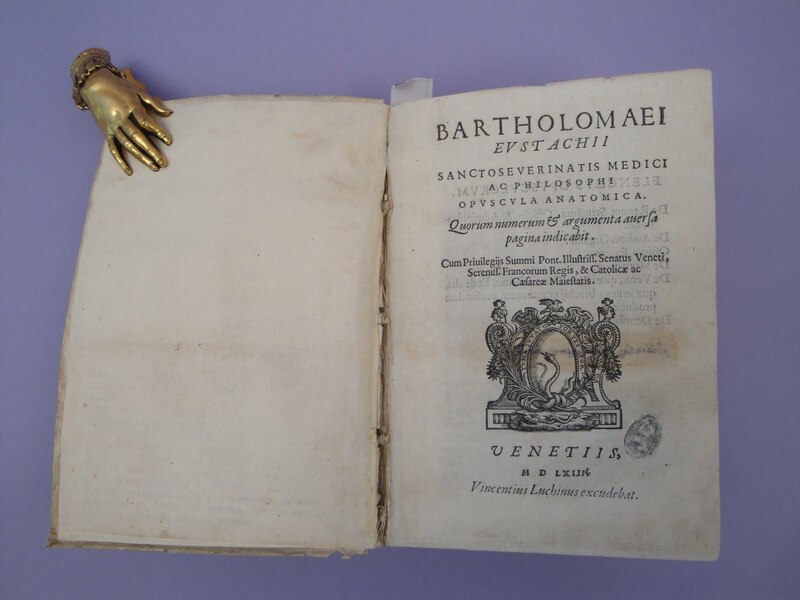 Among the most famous anatomical works of the sixteenth century is the Opuscula anatomica of the Italian physician and anatomist Bartolomeo Eustachi (Eustachius). In addition to several important anatomical studies by Eustachi, this work included annotations by Eustachi's relative and disciple, Pier Matteo Pini, and 8 engraved full-page copperplate text illustrations probably drawn by Eustachi and Pini, and engraved by Giulio de Musi, probably a relation of Agostino de' Musi (Agostino Veneziano). The illustrations are on the unnumbered pages between pp. 1-20 (first series). Pini also prepared the 168 pages of annotations to Eustachi's anatomical treatises from the writings of Hippocrates, Aristotle, Galen and other authorities published at the end of the book. Pini's published dedication of these Annotationes to Eustachi is dated July, 1561, suggesting that the genesis of Opuscula anatomica was several years in duration. Between 1561 and 1563 Eustachi wrote a series of anatomical treatises on the kidneys (De renum structura), the organ of hearing (De auditus organis), the venous system (De vena quae azygos graecis dicitur) and the teeth (De dentibus), which he issued together under the title Opuscula anatomica. De auditus organis is dated October 1562; De motu capitis January 1561. The dedication of Libellus de dentibus is dated December 1562. 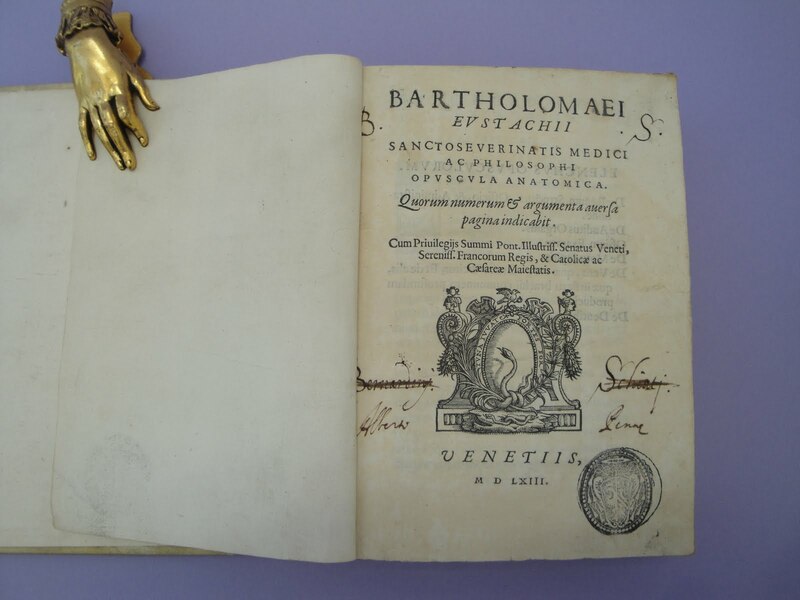 The privilege granting rights to the publisher Vincenzo Luchino is dated May 6, 1563. Most copies of this work bear the imprint Venetiis: Vincentius Luchinus excudebat, 1564. From the setting of the type on the title page of those copies it is evident that the original imprint date was 1563 and that an additional "I" was added to the roman numeral MDLXIII to turn that number into MDLXIIII (1564) —a contrivance since the correct roman numeral for 1564 would have been MDLXIV. Why the title page of this famous work would exhibit this typographical peculiarity was a puzzle which I had noticed but always ignored. In November 2010 I discovered in a group of "cripples" that I bought decades ago a very incomplete copy of the Opuscula anatomica with a titlepage dated 1563, and without the name of the publisher, confirming that some copies were issued with a 1563 date. The separate title page of Libellus de dentibus dated 1563 is similar to the first issue titlepage of the Opuscula anatomica in that it does not include the name of the publisher. Thus we may theorize that Luchino decided to add his name to the title page of the Opuscula anatomica as afterthought. When he did so in 1564 we may theorize most of the copies may have remained in sheets. If so, it was a matter of having the first sheet run back through the press. That may explain why both the final "I" in the roman numeral MDLXIIII and "Vincenzus Luchinus excudebat" are out of register. 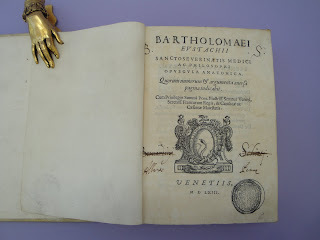 Eustachi's treatise on the kidney, the first work devoted specifically to that organ, showed a detailed knowledge of the kidney surpassing any earlier work; it contained the first account of the adrenal (suprarenal) gland and a correct determination of the relative levels of the kidneys. The treatise on the ear provided the first post-classical account of the Eustachian tube, while the work on the azygos vein contained the first description of the thoracic duct and of the valvula venae in the right ventricle of the heart, the so-called "Eustachian valve." In his treatise on dentistry, Libellus de dentibus, Eustachi was the first to study the teeth in any great detail: basing his work on the dissection of fetuses and stillborn infants, he gave an important description of the first and second dentitions, described the hard outer tissue and soft inner structure of the teeth, and attempted an explanation of the problem of the sensitivity of the tooth's hard structure. The engraved plates illustrating the Opuscula anatomica were the first eight in the series of forty-seven anatomical plates engraved by Giulio de' Musi, after drawings by Eustachi and Pini. They were prepared in 1552 to illustrate a projected book entitled De dissensionibus ac controversii anatomicis, the text of which was lost after Eustachi's death. 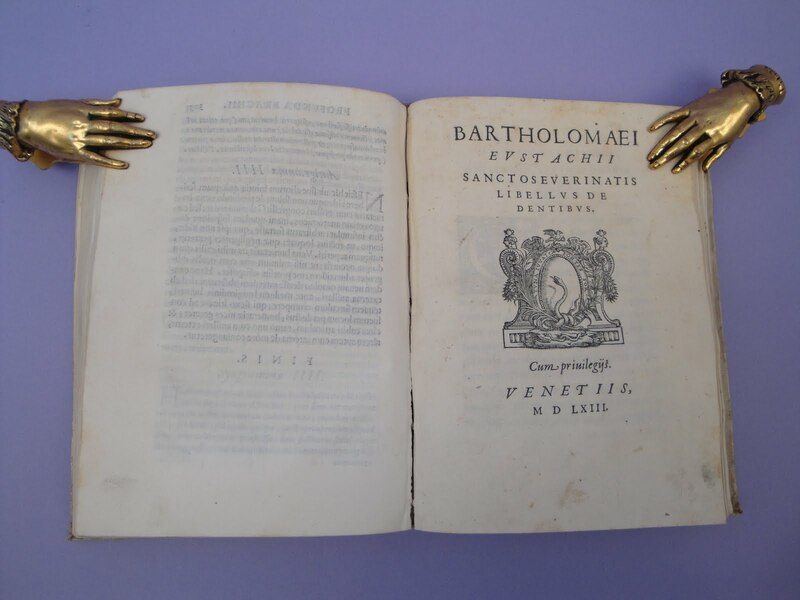 Had the full series of forty-seven anatomical copperplates been published at the time of their completion, Eustachi would have ranked with Vesalius as a founder of modern anatomy. However, it is quite probable that because of the growing fame of Vesalius' Fabrica (1543, 1555), Eustachi did not consider publication of his remaining plates, or his accompanying manuscript worthwhile. The remaining thirty-nine plates were lost for over a century after Eustachi's death but were rediscovered in the hands of a descendant of Pier Matteo Pini by papal physician, cardiologist, and epidemiologist Giovanni Maria Lancisi, who edited them for publication, and published them, along with the previously published eight plates, under the title of Tabulae anatomicae (Rome, 1714). Eustachi's plates are stylistically different from other sixteenth century anatomical studies, as they were produced without the conventional sixteenth-century decorative accompaniments and were framed on three sides by numbered rules providing coordinates by which any part of the image could be located. The publisher of the 1714 edition provided an unnumbered plate with graduated scales to be cut out and used as a location aid. The images are generic figures, composites of many anatomical observations, and are mathematically as well as representationally exact. Choulant, History and Bibliography of Anatomic Illustration (1920) 200-202. Hook & Norman, The Haskell F. Norman Library of Science and Medicine (1991) nos. 739-40. Norman, One Hundred Books Famous in Medicine(1995) no. 21 (stating, based on information then available to me, that the book was first published in 1563-64). When I checked OCLC in November 2010 there were four copies listed in European libraries as having the first state (1563) of the title page. A somewhat larger number of listings appeared for the second state. Giaonhan247 chuyên dịch vụ vận chuyển hàng đi mỹ và dịch vụ gửi hàng đi mỹ giá rẻ nhất cũng như biết được cước phí gửi hàng đi úc giá rẻ nhất. Making use of a water flosser aids you Water Flosser tidy these areas in-between WaterFlosserTricks your teeth spaces, and gum tissues.